Morality. Ethics. Convictions. All things that govern the way we live. The quote above is from Crazy Love. And yes, I am 100% guilty of thinking that exact thought. I literally told myself (on multiple accounts) that I wasn’t as bad as the girl living across the hall from me because I didn’t dress as provocatively as her. I also convinced myself that because I wasn’t chasing every guy that walked passed me, I had much more character than the girl who fell head over heels for every guy she came across. Whenever I couldn’t “make it” to church, I told myself that I was still a pretty great person for even trying to get a ride with someone. I mean, it wasn’t my fault that my ride didn’t wake up on time, right? It wasn’t my fault that I didn’t have a car at college. It wasn’t my fault that my friends decided to hang out till really late the night before. No, of course not. Nothing is ever my fault. To be honest, I was secretly kinda, sorta happy that my ride didn’t wake up in time…because that meant I could go back to bed. Hey, at least I tried. I’m not saying any of this to brag about myself or to condemn anyone. I’m saying this to raise awareness about something that is slowly but surely ruining those of us that grew up in the Church – a silent killer, if you will. The word “lukewarm” is defined as, “mildly warm; tepid; lacking conviction or enthusiasm; indifferent.” That is how I felt and acted towards the Lord. My heart was mildly warmed to Him. I lacked conviction of my sins – past and present. I lacked enthusiasm towards all things “God” related. I was indifferent towards Him. And even now, it’s difficult to not give into my lukewarm tendencies. Being a lukewarm Christian is bad enough when you know that you’re standing with one foot in heaven and one foot in hell. 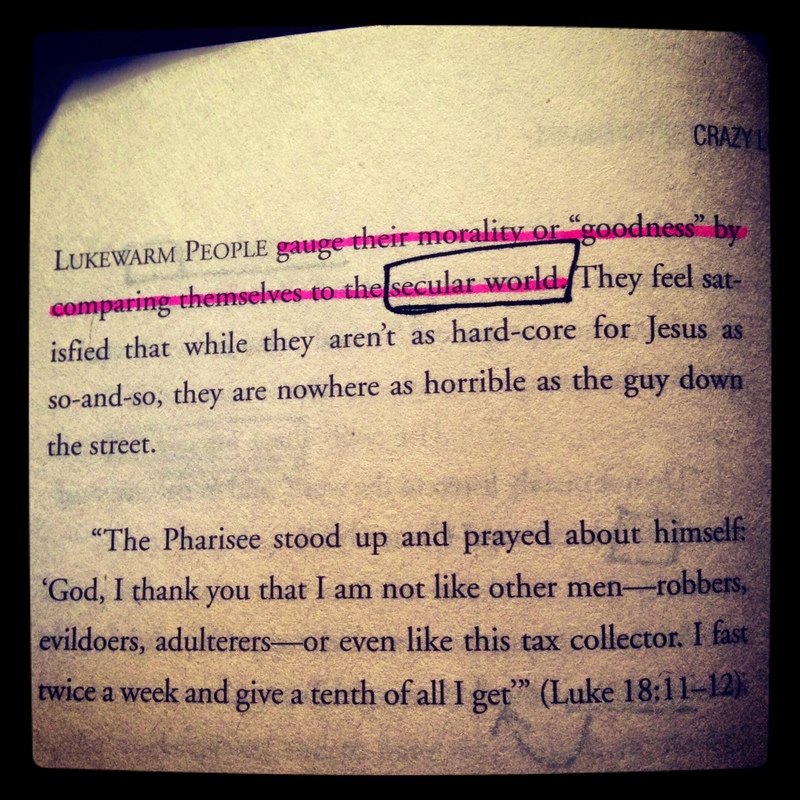 But being a lukewarm Christian and not even realizing it is far worse. It’s an extreme danger zone. And that’s where I was. Not realizing that I was actually spiraling out of control. Compromising myself, my faith, a little more with every second I spent wading in that tepid pool. God doesn’t want half-hearted followers, y’all. He wants real people whose hearts are set on serving Him – even though they may be unworthy and unprepared in every way. He wants us to stop being so indecisive. He wants us to make a decision: Him or the world. And oh, how He wants for us to choose Him! The world offers us many pleasures. But none of them last. None of them can satisfy our thirst for more. They meet our cravings for the moment and then they disappear, leaving us with a gnawing hunger for more, more, more. Being lukewarm is easy. It happens without us even realizing us. This is especially the case for those of us who grew up in a Christian home. We are so prone to falling victim to this disease that has infiltrated the Church. Many of us think we are on the right path, that we are good people. And that may very well be true. But is it enough to be a “good person?” Is it enough to simply be kind and generous and accepting? Is it enough to have family prayer every morning and evening? Is it enough to go to church every Sunday, Wednesday, and Saturday? Is it enough to attend a Bible study or quote a few good Bible verses here and there? I mean, really ask yourself these questions. No one is sitting there waiting to judge your answers. Be real with yourself. Be real with God. Ask yourself if you’re just going through the motions. Ask yourself why you do the things you do, why you believe the things you believe. Do you believe Jesus died for your sins because your mom and dad told you that from the moment you were born? Do you believe Jesus died for your sins because that’s what every other 7 year old believed too? Do you believe going to church and being an all-around good person is what you were created to do? For a long time, that’s what “faith” was to me – that’s what being “Christian” meant: going to church, being super active in all the youth activities, reciting Jeremiah 29:11 to anyone who needed a “pick-me-up,” highlighting verses all throughout my Bible, taking notes during the sermon, discussing how “off the path” someone was but never, ever gossiping, making people think I was a good role model simply because I didn’t swear like a sailor, etc. For a long time, I believed I was a good Christian because of all this stuff. I loved God because I was supposed to love God. Not because I was truly, madly, deeply, in love with Him. I did the right things, said the right things, and deceived everyone. In reality, my faith wasn’t real to me. Yes, I believed that Jesus died for my sins. Yes, I cried during The Passion of the Christ. Yes, I was going to heaven. But my faith was so shallow. So superficial. I had barely touched the surface. Although I loved God, I was in love with the world. Everything about this place we live in is so intoxicating; everything in this world appeals to our senses. But the one thing this world cannot offer us is the sense of being fully satisfied. We can continue to immerse ourselves in the pleasures of this fleeting world, or we can pull that foot out of hell and dive head first into the overflowing, abundant joy that awaits us in heaven. We can’t continue being indecisive. We can’t continue playing the harlot. We were made for more. We weren’t created to be cheap, mindless toys for the devil to play with. We were created for a purpose (Ephesians 2:10). We were created to experience REAL joy and REAL love. We were created to Love and be Loved – not by another human, but by the One who IS Love. We weren’t created to wade around in lukewarm water. We were given a spirit of power, and love, and self-control (2 Timothy 1:7). Power to overcome all things, love to pour upon every soul, self-control to resist the flesh. We weren’t made made to judge each other or judge ourselves. We have no authority to claim that we are righteous in and of ourselves. We are no holier than the atheist next door, than the homosexual across the street, than the murderer living out his sentence in prison, than the Muslim performing his daily prayers, than our fellow Believers at church. To put it bluntly, we need to get over ourselves. We need to be real with ourselves and with God. We need to ask the tough questions. We need to evaluate and reevaluate our lives. We need to do these things actively, frequently. Because if we don’t, we’ll suffer the same fate as the Pharisee mentioned in Luke 18. Are you in love with the Lord? Are you head over heels for Him? If you are, then I pray that you continue to serve Him with all of yourself. I pray that you only fall more deeply in love with Him with each new day. If you aren’t, get real with yourself. Make today different. Call on Him to help you, to give you a hunger for more of HIM and less of the world. Pull yourself out of that tepid water and dry yourself off. Let His Love for you consume you and set you on fire for Him. The Lord is an all-consuming fire. He IS love. And honestly, what could be better than being set ablaze by Love itself? Examine yourselves, to see whether you are in the faith. Test yourselves. Or do you not realize this about yourselves, that Jesus Christ is in you?—unless indeed you fail to meet the test! I hope you will find out that we have not failed the test. But we pray to God that you may not do wrong—not that we may appear to have met the test, but that you may do what is right, though we may seem to have failed. For we cannot do anything against the truth, but only for the truth. For we are glad when we are weak and you are strong. Your restoration is what we pray for.